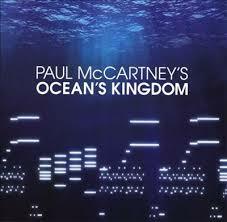 Ocean's Kingdom is the fifth classical album by Paul McCartney. It consists of 4 movements and played by London Classical Orhestre directed by John Wilson. Album was released by Hear Music in CD and vinyl format and I review the album from on double vinyl format. McCartney makes much of his approach to classical compositionm being " driven by his heart rather than his head,and inspired by feeling rather than specific technical knowledge"
As a classical music fan, I have to say that trouble is, there's no getting away from the fact that in large-scale orchesral composition you really do need the head as well. Trouble is, there's no getting away from the fact that in large-scale orchestral composition you really do need the head bit as well. I especially liked the second movement. The beginning was a lot of fun, full of energy and life. I particularly enjoyed the woodwind solo. It was really easy to follow the music and imagine what was happening. You could tell that the first movement was an introduction of characters. You could tell when the bad guys come in and when the lovers are together. It really was fun trying to imagine what was happening and when, and it was cool to actually be able to do so. Maybe real classical music fans turn their noses up at this album, but I explained approach of Macca to classical music and yes he is not a Tchaikovsky or Stravinsky and just probably he inspired from them, but his work on this album is a really good job and each classical lover should listen to .